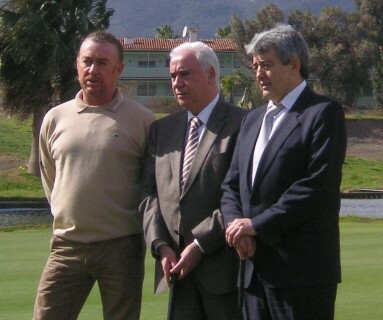 THE LAST TIME the Open de Andalucía was held at Málaga’s venerable Parador course, Miguel Ángel Jiménez delighted local fans with a resounding four-stroke victory. Now the Churriana-born player will be back at the course from 25 to 28 March in his dual role as promoter of the tournament and one of the European Tour’s established leading lights. Just days after winning his 16th Tour title, the Omega Dubai Desert Classic (Ferrari Class on the Fairways), Jiménez presided over a multitudinous press conference at the Parador, accompanied by the regional Andalucian Consejero (Minister) for Commerce, Tourism and Sport, Luciano Alonso, and the Paradores president, Miguel Martínez, to present the ninth edition of the tournament – and third at the Parador. 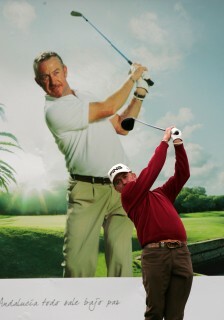 Vijay Singh won the 1992 Turespaña Masters Open de Andalucía at the course, Spain’s fourth oldest; while Jiménez broke the course record with a third-round 62 on the way to victory in 1999. Jimenez’s company Fade & Draw Target first organised the event at Aloha in 2007 (won by Lee Westwood), following that up with the 2008 edition also at the Marbella course (where Thomas Levet was victorious), before it moved to Sevilla last year. Søren Kjeldsen will be the defending champion when the 2010 Open de Andalucía (sponsored to the tune of more than €1 million by the Junta de Andalucía – or regional government) becomes the first European Tour event of the season to actually be held in Europe, after its customary early-year sojourn through South Africa, the Middle East, Asia, the US and Morocco. The event clashes with the Arnold Palmer Invitational on the US Tour at Bay Hill, where the world’s top 50 players are traditionally invited, but Jiménez said many players have said they will prefer to compete in Spain – especially as this is a Ryder Cup year. In fact, of his own chances of making a fourth appearance in the Cup, the Spanish star – fourth on the money list after his Dubai win (and 30th in the world rankings) – said it was always an objective, but now “closer”. With captain Colin Montgomerie now having three wild card picks instead of the former two, Jimenez will certainly be near the top of his list if he doesn’t maintain his momentum until September and gain an automatic berth from the Cup world list (four) or Tour list (next five not already qualified). Also on hand at the Parador to lend their support to the region’s promotional campaign were fellow local players Pablo Martín (winner of the first event of the 2010 European Tour, the Alfred Dunhill Championship), Azahara Muñoz (who won her first tournament as a pro, the Madrid Ladies Masters on the 2009 Ladies European Tour – Awesome Azahara), Juan Quirós (a three-time winner on the European Senior Tour), Ana Belén Sánchez (a former LET champion) and Laura Cabanillas (victorious in the final event of the 2009 national Banesto Tour for women pros). • Entry is free to the tournament on the first two days; €10 for each of Saturday and Sunday; and €15 for the whole weekend. It is free for children under 16.